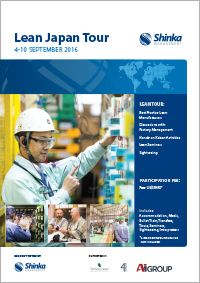 The September 2016 Lean Japan Tour will be held on Sunday 4th through Saturday 10th of September, and will include kaizen seminars, practical lean training and visits to factories for meetings with senior management. For further details of the tour and to read about past visits see our kaizen tour page. Contact us to express your interest in participating or download the registration form to sign up now. The September 2016 tour is targeted at English-speaking professionals from across the globe.